If you’re looking for a special and lifetime experience, then a full-day trip to Vladimir, an ancient town of Golden Ring of Russia, is just what you need. You may want to extend the tour a bit and make it Vladimir + Suzdal adventure. Your private guide will meet you in the hotel lobby and will be your companion throughout all the tour. 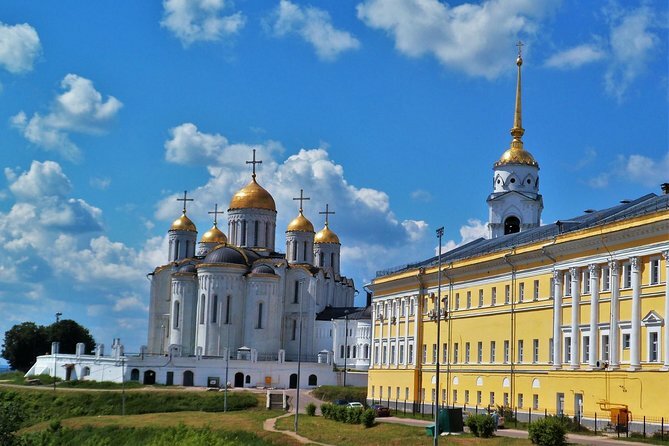 The town of Vladimir was first mentioned in 988 AD and it is the museum under open sky. You will see ancient Russian cathedrals and churches, Golden Gates - constructed in 1164 - the only one remained out of the seven entrance gates to the city. You will soak up the atmosphere of local life and culture passing by the monuments, museums, parks, gardens and beautiful squares. During the tour you will have 2-3 stops for lunch and coffee break to fuel up. After the tour you will take a train/bus back, whatever will be the fastest option on that particular day to avoid traffic. Timing is flexible and you can start the tour any time you prefer. However, 8.30am is recommended due to long duration of the trip.